The History of Curtis Township. NOTE: Catherine Clary wote the following article as a school assignment during the period when the Alcona Dam was under construction, between 1914 and 1924. Added notes to provide clarification have been enclosed in [ ] brackets. Ebenezer Curtis was the first white man to settle in Curtis Township. Mr. Curtis came here from Maine, May 1867 with his family consisting of three daughters and one son. The son died in later years. Mr. Curtis was of English descent. He was a strong able bodied man able to stand the hardships of pioneer life. He would often walk to Tawas, which is about thirty miles from here, where he would get supplies. He first got his mail from Tawas, later from Potts, what we now call McKinley, then from South Branch. In 1900 a post office was established in Curtisville, by Joseph Bell. Mr. Curtis' first neighbor was John Calegrove who lived near McKinley. He came here in September of the same year, also from Maine. Marvin Wilber lived near the creek which now bears his name, Richard Cage lived on what we now call the Tanner Farm, owned by the heirs of Louise M. Gates. 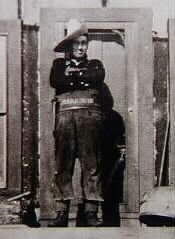 Caleb Smith lived two miles south of Mr. Curtis on the creek which bears his name. Mr. Curtis was a great lumberman. He was a noted axeman and at one time was the best around here, though many men were noted axemen. He had charge of many lumber camps for Moore and Alger, also Beech and Mansfield. Melvina Curtis was Mr. Curtis' oldest daughter. She was married to Manley Wilber at the home of Mr. Curtis in 1870. They were married by Rev. Beardsley who was brought from Tawas by Tom Langsley. Mr. and Mrs. Wilbur moved to Tawas were they lived many years. [NOTE: The village of Wilbur, Iosco Co., Michigan is named for this family. The Wilburs' moved to Washington where Mr. Wilbur was active in the lumber industry, the town of Wilbur, Washington is named for him]. Richard Curtis was the first white child born here. At that time Mr. Curtis was living on Smith Creek where he was running a lumber camp. Richard was born in 1864 & Mrs. Cage acted as his nurse. He still lives on the old Curtis farm. In the late 50's or early 60's Allen Ash of Tawas explored the township overlooking timber. About the same time came Charles Orr, Thomas Walker, John McDougall & James Conn for the same purpose. Jessie & Florence Heilig and Causis Cordon were teachers for Curtisville. Jessie & Florence Heilig were married and left off teaching school. Florence died about four years ago. Causis Gordon is still teaching. This year he is teaching at Lott school in Curtis Township. Mr. Hayes of Glennie was a great lumberman until the lumber was all gone. Mr. Curtis of Curtisville was a great axeman in his day. Mr. John McFarlane of Glennie established Moses Marks & Co. the first bank in the township. The soil in Curtis township is very rich and rainfall pleniful. This makes agriculture a leading industry. The AuSable gives an abundant supply of water. We also have a few small lakes and streams and a few springs. Timber was very plentiful in days gone by, but most of it has been cut away for timber or destroyed by forest fires. The logs for timber were floated down the AuSable River to the saw mills. Now the river is being put under control by dams to supply electricity for lights and power to many places. The AuSable River , Wilbur Creek and Smith Creek are fine trout streams. During fishing seasons many of the people visit these streams. In our lakes we find several kinds of fish. Deer are still found in the river swamps and foxes on the plains. There were two main roads during the first few years of settlement. One was on the east side of the AuSable River called State Road. The other was on the west side of the river called River Trail. The State Road runs through Lott & Glennie. The River Trail runs through Thompsons farm and Calgrove farm. [NOTE: River Trail was also known as the Tote Road, it ran from Tawas to McKinley]. An old toll bridge crossed the AuSable at Bamfields and was called Bliss Bridge. This bridge was made of logs. Later it was taken away and a bridge of hewed timber called Bamfield Bridge took its place. [NOTE: The areas where these bridges were located are under the backwaters behind the Alcona Dam]. Many roads have been built through the township. Some partly gravelled and some dirt roads. County road extends nearly across the township and we hope to have a state road soon. A narrow gauge railroad was built in 1886 from Potts to Oscoda and called Potts' railroad. Later it was sold to Loud who came up here to lumber and it was then called the Loud line. Loud sold it to the Detroit and Mackinaw railway company who made it a modern railway. Early means of transportation was by heavy teams and wagons and also the stagecoach. Sam Parks now living at Mio was the first man to drive the stage. He drove from Oscoda to Potts. He stopped at Eli Barker's to get fresh horses. Barker then kept a road house. He carried both mail and passengers. At the present time our products are taken from our home by horses and wagons or trucks to Glennie where we get our groceries and things we need while our produce is sent out on trains to large cities. The pioneers were very good to one another because there were no such things as what we have now days. In case of sickness the women folks helped because there were no doctors, nurses or hospitals for thirty miles away. There [sic] chief medicines were herbs. When people had a barn raising all the people turned out. The men helped raise the barn while the women helped get dinner and supper. Then they had a barn dance for the young people. They would go home in the gray of the morning or the next day. When they butchered one or two of the neigbors came to help. When they went home they took a piece of meat for their days work. In the fall people would make soap. It was made by boiling in a large kettle over a wood fire built out of doors. At this time they would also have husking bees. It afforded lots of fun for the young folks for they looked for the red ears of corn. The women helped husk the corn so the men could go to the woods. When a new settler came into the settlement the men all went and helped him clear his land for cultivation the next year. In the spring they would tap the maple trees for the sap. They would gather it in tanks and kettles, then boil it in a large kettle. In this way they had their own sugar and sirup. Moore and Alger had the first lumber camp here. It was run by Richard Cage. the logs were cut in the winter, iced roads were made and these logs were hauled to the river. In the spring these logs were floated down the rivers to the mills. Jule Simons was the first to own and operate a saw mill. It was a small portable mill. He cut logs for the pioneers to use in building their houses. The first church built in Curtisville in 1886 by Baptists. There are now three more churches besides this one. Another Baptist church at Lott, a Methodist church and a Seven Day Advent church in Glennie. The Baptist church at Curtisville was organized November 12, 1886. It is built on Mr. Curtis' farm. Back of the church is a small valley giving the place a beautiful appearance. The church is painted white. Many changes have taken place since this church was built. The first school was built at Lott in 1881. In the same another was built near Twin Lakes called Lakeview and another was built at Curtisville. The first teacher of the Lott School was Mary Morrison. The first school at Curtisville was at John Bowser's. Later a building was erected on the northwest corner of section 20. This was a small log building. Miss. Effie Kelley was the first teacher in the Curtisville school. At that time Mr. Gordon was director and John Bowser treasure [sic]. The Grange was organized at Glennie and on Nov. 5, 1891 a Gleaners orgainzation was started in Curtisville. The first town meeting was held at David Bowser's in 1881. Mr. Reynolds of Harrisville was present to organize the township. The leading party in the township was the People's Party. The first farm to be worker in our township was the Tanner farm now owned by heirs of Louise M. Gates. 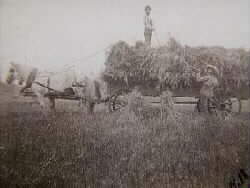 The Curtis farm was one of the first farms. It was cleared and worked by Ebenezzar [sic] Curtis who died in 1911 leaving Richard in possession of the farm. H. C. Gordon's farm is one of the first farms. It was partly cleared and worked by Marvin Wilbur. The settlers raised hay, potatoes and oats. They sold these to the lumbermen. There are a large number of farms in our township. There are two ranches in our township. The Gates Ranch owned by heirs of Louise M. Gates. The H. H. Ranch owned by some men from Detroit. The passing of the lumber business made people depend on their farms more than they did before. Haying on the Wilkinson Farm. Our rivers, lakes and creeks are things of pride because of their beautiful scenery. We have hills that are very high and covered with many green trees. Our roads, etc. Our roads and bridges have been improved. Also our farms. Glennie has two nice country stores, a drug store, two banks, a post office, a hall and blacksmith. 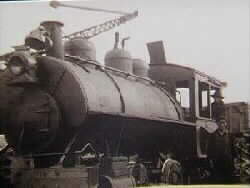 Locomotive at the Alcona Dam Project - Charles D. Curtis is setting in the engine. A large dam is being constructed on the AuSable affording work for hundreds of men. This is the Alcona Dam. Another is to be built at the edge of our township near Flat Rock. [NOTE: The dam planned for the Flat Rock area was never built]. [NOTE: The individuals identified above that served in Russia were in the Polar Bear Divison, they were in Russia during and after the Communist take over of the country]. Curtisville gave aid to the Red Cross, and the schools organized the Junior Red Cross. The people bought Liberty Bonds and War Savings Stamps. They also ate rye bread and used little sugar to save for the soldiers. The above material & photos were furnished by Ronald J. Sortor. Page copyrighted 1997 by Norman M. Vance.